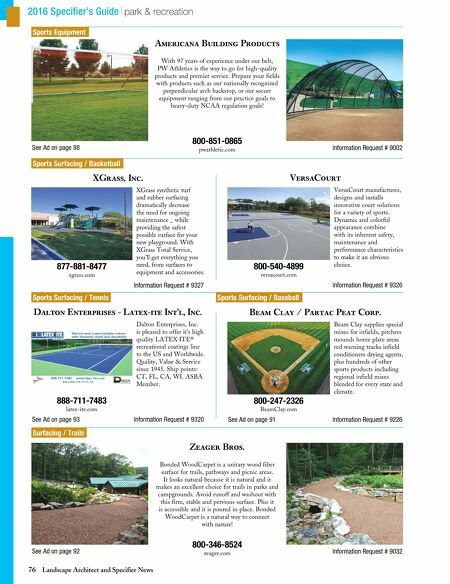 76 Landscape Architect and Specifier News 2016 Specifier's Guide park & recreation Sports Equipment Sports Surfacing / Basketball Sports Surfacing / Tennis Surfacing / Trails Sports Surfacing / Baseball See Ad on page 88 Information Request # 9002 Americana Building Products 800-851-0865 pwathletic.com With 97 years of experience under our belt, PW Athletics is the way to go for high-quality products and premier service. Prepare your fields with products such as our nationally recognized perpendicular arch backstop, or our soccer equipment ranging from our practice goals to heavy-duty NCAA regulation goals! 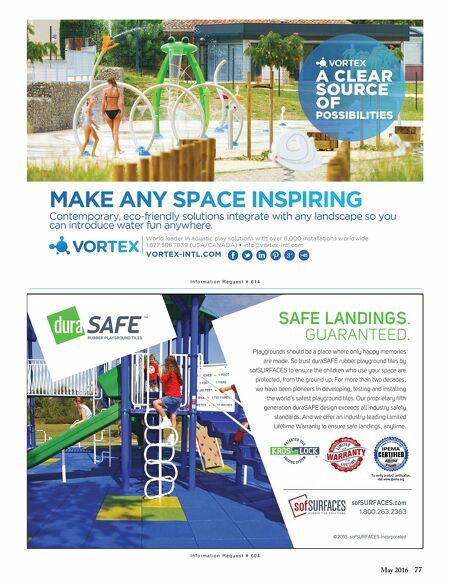 XGrass, Inc. Information Request # 9327 XGrass synthetic turf and rubber surfacing dramatically decrease the need for ongoing maintenance _ while providing the safest possible surface for your new playground. With XGrass Total Service, you'll get everything you need, from surfaces to equipment and accessories. 877-881-8477 xgrass.com VersaCourt Information Request # 9326 VersaCourt manufactures, designs and installs innovative court solutions for a variety of sports. Dynamic and colorful appearance combine with its inherent safety, maintenance and performance characteristics to make it an obvious choice. 800-540-4899 versacourt.com Dalton Enterprises - Latex-ite Int'l, Inc. See Ad on page 93 Information Request # 9320 Dalton Enterprises, Inc. is pleased to offer it's high quality LATEX·ITE® recreational coatings line to the US and Worldwide. Quality, Value & Service since 1945. Ship points: CT, FL, CA, WI. ASBA Member. 888-711-7483 latex-ite.com Beam Clay / Partac Peat Corp. See Ad on page 91 Information Request # 9226 Beam Clay supplies special mixes for infields, pitchers mounds home plate areas red warning tracks infield conditioners drying agents, plus hundreds of other sports products including regional infield mixes blended for every state and climate. 800-247-2326 BeamClay.com See Ad on page 92 Information Request # 9032 Zeager Bros. 800-346-8524 zeager.com Bonded WoodCarpet is a unitary wood fiber surface for trails, pathways and picnic areas. It looks natural because it is natural and it makes an excellent choice for trails in parks and campgrounds. Avoid runoff and washout with this firm, stable and pervious surface. Plus it is accessible and it is poured in place. Bonded WoodCarpet is a natural way to connect with nature!